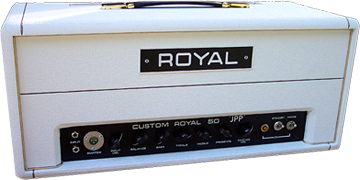 RoyalAmps.com - Homepage - The Royal Amp Co.
Royal Audio & Visual LLC proudly produces custom hand-built amplifiers and was the first to offer the JPP100 model based on the Hiwatt amp used by Jimmy Page at the Royal Albert Hall with Led Zeppelin. This was his main amp for live shows for nearly two years during the band's formative years. Royal also produces the MSG100, which is based on the modded plexi amp Page used for the Madison Square Garden shows in 1973 and beyond. Both amplifiers are available in 50 watt models as well. 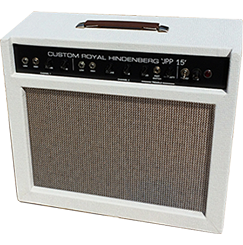 In addition to the JPP and MSG line of amps, Royal also offers the Hindenberg Supro 1624T replica, vintage Plexi replicas and restorations. From 1969 to 1971, Zeppelin's acclaimed guitarist used a custom-built Hiwatt amplifier with his name engraved on the front panel. Contrary to popular belief, Plexis were not his amps of choice for live shows during that time period. Based on a relatively rare circuit, his signature amp combined the tone of classic Hiwatt amps with the smooth saturation and response of a vintage Plexi. This extraordinary combination of features that made his signature amp so unique is now available again. To many, the custom Royal JPP model will be a dream come true. It has the dynamic range and hi-fi tone that emanates from early Hiwatt amps, yet it has the character and smooth gain associated with the best vintage Plexis we all know and love. From 1973 on, Page used modded 100w Plexis and metal panels that had increased headroom with more refined lows, mids, and highs. These amps used KT88 tubes instead of the factory stock EL34s. With the right combination of guitar, pickups, and speaker cabs, this amp can coax your tone into its fullest expression. Now the elusive midrange honk and middle tone we all know and love comes alive. With the neck pickup setting you can conjure up the complex hollow bloom found on live versions of the “No Quarter,” and “Sick Again,” solos. The bridge pickup setting allows for the “clarity with balls” tone associated with this famed era as well. There is no modeling system or “JP in a box” that can substitute for the real thing. In 1968, Jimmy Page recorded the first Zeppelin album with a relatively low power Supro 1x12 amplifier. He occasionally used it in the studio on subsequent albums as well as the Stairway solo. Introducing the Hindenberg 15w, Royal Audio & Visual LLC's newest model! An amp that is sure to interest any Led Zeppelin fan as well as all guitarists who crave great tone and build quality. This amp replicates the sought-after Supro 1624T model but is modified to the configuration as used by Page. Unlike the modern production name brand with inexpensive PC boards and new off-the-shelf components, we build these amps using vintage Paxolin tag boards, quality CTS pots, Switchcraft jacks, and Sprague filtering. Waxed lacing cord is used to bundle wires for a vintage look, durability, and easier serviceability. Transformers are made by the original manufacturer and maintain the same build quality, look, and sound. As expected, there is no better build quality available than what is produced by Royal. Royal Audio & Visual LLC is in no way affiliated with Marshall Amplification or Hiwatt Amplification.